Given our experience flying into the Himalayas two weeks ago, we were all a bit worried about the weather and its potential impact on our return to Kathmandu this morning. Thankfully, the skies were crystal clear as Dawa confirmed that we would be on the 7:30 a.m. Tara Air flight 2. Just after dawn, the first plane began its terrifying take-off down the short runway. Sitting in the airport lounge, we reflected on squat toilets, sleeping bags, rice and freezing cold. Nearly everyone in the group had developed some type of Trail Cold — after days of breathing in dust and dung, there was lots of sniffling and coughing going around. Our bodies were hurting. How we felt now though didn’t detract from the overall experience. In fact, the accomplishment was just starting to settle in. We continued to ask ourselves: How did we ever do this? Back in Kathmandu, we transferred back to the Hotel Manang and said goodbye to our guides and some members of the group. Given the lousy accommodation, most of us booked additional nights at the Kathmandu Guesthouse, a well-known institution located just down the road, with a sunny garden courtyard. Perfect for post-trek lounging. But we couldn’t rest long. After showers, there was important business to attend to. Namely, food, food and food. Deprived of meat, flavor and any sense of satisfaction on the trek, we had decided our first stop would be an institution guaranteed to provide all three. Strangely enough, KFC is actually an upscale eatery in Nepal. My three piece meal with a tiny flat Sprite and handful of fries was about $7 USD. Was it worth it though? Absolutely. The chaotic streets of Thamel were surprisingly welcome after nearly two weeks in the mountains. We took in all it had to offer — the ceaseless touts, confined streets overflowing with vehicles, exposed electric wires, even infants dangling off the backs of mopeds. Having lounged off lunch, we gave our Lonely Planet a quick read and got motivated for a trip to Pashupatinath. This is Nepal’s most important Hindu temple, sitting on the banks of the holy (highly polluted) Bagmati River, just a few hundred meters from the end of the airport runway. We took a taxi driven by Diamond there and survived the gauntlet of religious stalls selling all types of paraphernalia: incense, beads, conch shells, rainbow colored powder. Many of the site’s temples are off limits to non-Hindus. But on the riverbanks is an amazingly unique and interesting ceremony that can be viewed in its most authentic form. 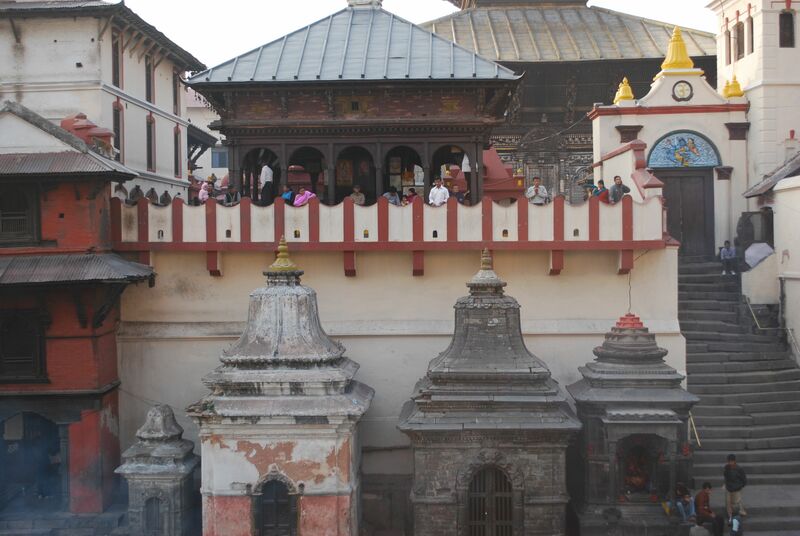 Eight cremation ghats line the Bagmati River for open-air cremations that take place continuously throughout the day. It all happens in a very automated business-like way. Local onlookers sit and chat from the other side of the river. 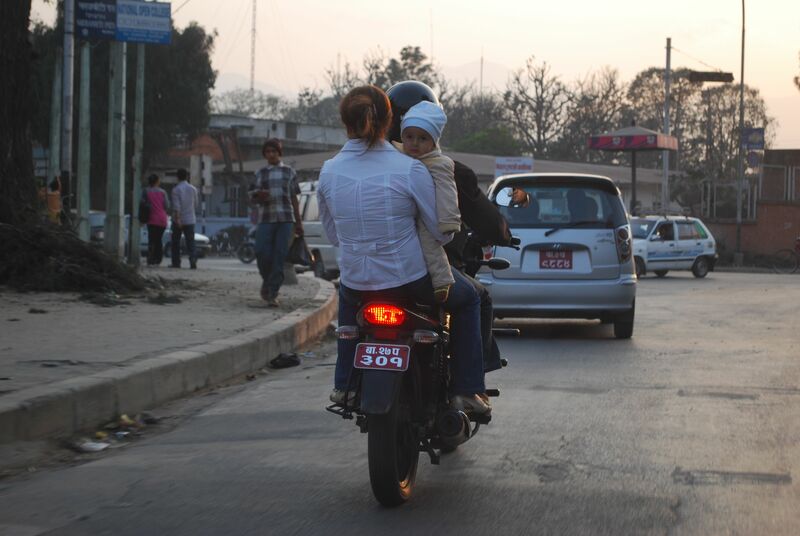 Simply, this is a part of life and death here in Nepal. We wandered around for about 45 minutes and then Ben got some ash in his eye and we decided that might be a sign for us to leave. Diamond was waiting for us and took us back to the Guesthouse, where we cleaned ourselves up and then headed out to dinner at Fire & Ice, which served up Kathmandu’s most authentic pizzas. Topped with mozzarella, olives, ham and artichoke hearts, mine was easily the best meal that I’ve had since arriving in this country.